Upon arrival at airport met our representative and then transfer to hotel for overnight stay. In the morning take a half day guided sight seeing at Delhi. In the evening drive to Manali by AC Volvo coach. Overnight journey. Arrival at Manali by morning and then transfer to hotel for relax & acclimatisation. At leisure visit Hadimba Devi Temple, old Manali and the Mall road. Dinner and overnight stay in the hotel. 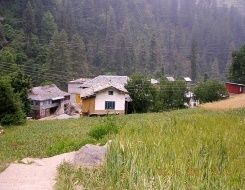 In the morning we will drive in Kullu Valley. We will leave the main road after a drive of 70 kms. Then we will enter Sainj National Park till Sahiropa. On arrival set out a camp for overnight stay. First day of trek. Gradual climb through forest of pine cider to the Bhihari village with its traditional mountain architecture situated a top of the ridge as well providing extensive view of the valley, temple of the Shringa Rishi (Saint Shringa) impressive role in Indian Mythology is in direct vision. A short walk to the temple with its Shikhra style of stricture, inside the temple impressive carving which is representing mythological history of India although lord Vishnu visit temple and pay homage to the Saint Shringa, camp site close to the temple. Dinner & overnight stay in tents. A Ancient nine story castle was built by queen Chehni, Thus the name Chehni derived from the queen. Marechh may take over from her. Latter British took over this castle, Raja Maan Singh was the last king .of this castle. In 1905 AD Due to heavy earth quake in India its top three floors has been collapsed and it was rebuilt immediately. On the top floor main place of the Saint Shringa is remain through his mask, one can climb up to pay the homage. (Those who have vertigo problem are not advised to climb up. )Leave the Chehni Kothi and continue through the forest is well known for its flora, on the way lunch stop on ideal place, easy walk to the camp site. Easy trail in beginning through villages till Ghyaghi, cross a stream and steady climb for 3 hours to Shoja village, camp site after short distance out of village. One of the most beautiful sites providing breathtaking view as well dominating the valley. The trek starts, 6 hours, over Jalori pass (3115 m), via Sarau Sar (holy lake). Leave Shoja early in the morning, as it is a long day. The trail winds through the lovely dense forests teeming with an amazing variety of bird life. Chances of spotting the Himalayan black bear and the elusive Monal Pheasant are quite good! From the pass, easy ascend to the lake dedicated to the local God Descend to the campsite in Khanag. A gradual ascend and steep path leads to the Beem village. After level walk offers a magnificent view of the surrounding hills. After a relaxed lunch on the fringe of a forest, the campsite of the Tarala is reached with a beautiful ground of rest house nestling by the wood. 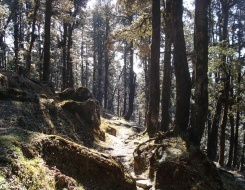 From Tarala, the trail gains height and passes through thick forests. High up in the trees, the Himalayan lagoons (monkeys) particular to this area, can be seen swinging and chattering. After lunch, a short walk to the beautiful campsite. The 5515 m-high Sherkhand Mountain is mythological significance, being abode of Lord Shiva, but also affords a beautiful panorama. One of the most beautiful camp sites of the trek. Very pleasant walk to the campsite. It is a short day, and however it offers a nice view of the valley. Last day of the trek. Rampur can be seen at a far distance, other side of the river. After check in hotel explore ancient capital. In the morning after breakfast drive to Shimla. On arrival at Shimla check in to hotel for relax. In the evening take an AC Volvo coach for Delhi. Overnight journey.